Midtown Manhattan, or Midtown, represents the central lengthwise portion of the borough and island of Manhattan in New York City. Midtown is home to some of the city&apos;s most iconic buildings, including the Empire State Building, the Chrysler Building, and the headquarters of the United Nations, and it contains world-renowned commercial zones such as Rockefeller Center, Broadway, and Times Square. Along Manhattan&apos;s north-south long axis, Midtown Manhattan separates Lower Manhattan from Upper Manhattan. Midtown Manhattan is the largest central business district in the world and ranks among the most intensely used pieces of real estate in the world. While Lower Manhattan is the main financial center, Midtown is the country&apos;s largest commercial, entertainment, and media center; Midtown Manhattan is also a growing financial center, second in importance in the United States only to Lower Manhattan&apos;s Financial District. The majority of New York City&apos;s skyscrapers, including its tallest hotels and apartment towers, lie within Midtown. The area hosts commuters and residents working in its offices, hotels, and retail establishments; many tourists, visiting residents, and students populate the district. Some areas, such as Times Square and the Fifth Avenue corridor, have large clusters of retail stores, and Times Square is the center of Broadway theatre. The Avenue of the Americas holds the headquarters of three of the four major U.S. television networks. Two campuses of the City University of New York (CUNY)—the doctorate-granting CUNY Graduate Center and the Stella and Charles Guttman Community College—are located in Midtown, while Baruch College, also of the City University of New York, is located in Midtown South. New York City Department of Education public schools in Midtown Manhattan include Jacqueline Kennedy Onassis High School and Norman Thomas High School. Private schools include The Beekman School, Rebecca School, and a number of private language and music centers (e.g. Berlitz, American Language Communication Center, New York Language Center, Swan Music School, and the New York Youth Symphony). The La Scuola d&apos;Italia Guglielmo Marconi Italian international school will move to West Midtown in 2016. In addition to its well-known Main Branch research library—now known as the Stephen A. Schwarzman Building—the New York Public Library operates the Science, Industry and Business Library at 34th and Madison, the Mid-Manhattan Library at 455 Fifth Avenue (at 40th Street), the Grand Central Library on East 46th Street, and the 58th Street Branch Library at 127 East 58th Street, between Park Avenue and Lexington Avenue. 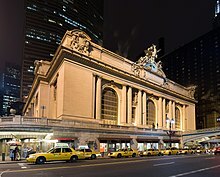 Pennsylvania Station and Grand Central Terminal are major railroad stations located in Midtown Manhattan. The Port Authority Bus Terminal is also in Midtown. The New York City Subway and MTA Regional Bus Operations each operate several routes that go through Midtown.